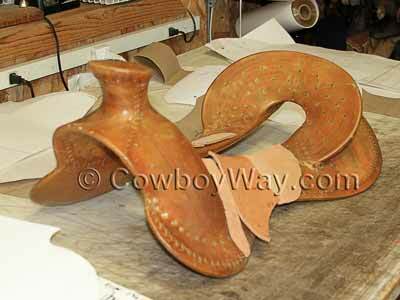 Below are roping saddles for ranch and arena for sale. 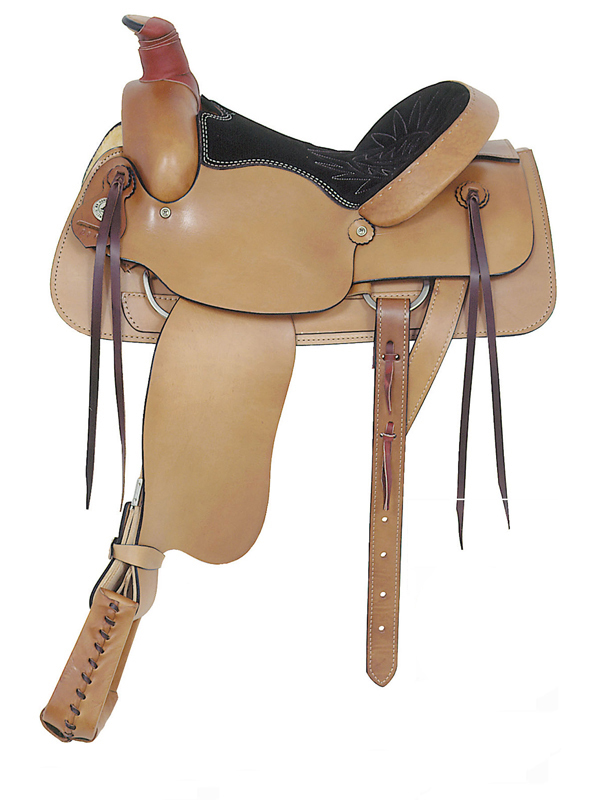 Large selection from big name makers like Billy Cook, Tex Tan, Dakota, and also custom saddles. 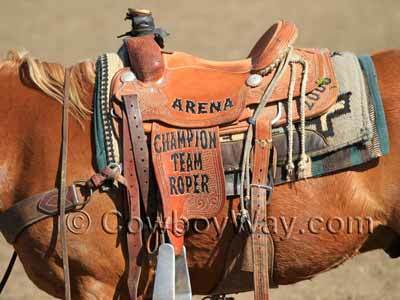 Below: A trophy team roping saddle. 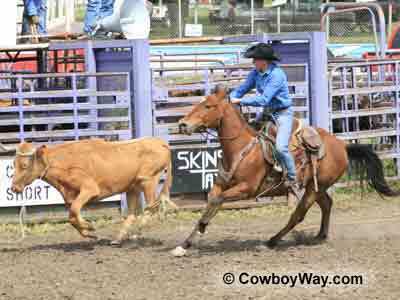 Below are roping saddles for sale from several major online sellers. What Is A Roping Saddle? 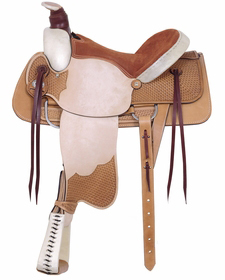 The term "roping saddle" refers to a Western type of saddle specially built for roping cattle. Most roping saddles are either "full-rigged," "7/8 rigged," or "3/4 rigged." This means that the front cinch is farther forward toward the front of the saddle than an older style of rigging called "center fire." Full-rigged, 7/8 rigged, and 3/4 rigged saddles are designed to handle the force and stress of roping, both on the saddle and on the horse. 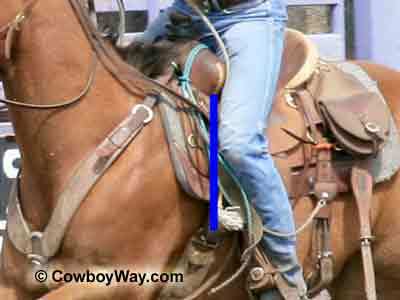 Since the front cinch on a roping saddle is fairly far forward, a roping saddle will often also have a a second cinch, called a "back cinch" toward the back of the saddle. 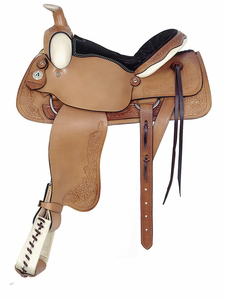 A back cinch prevents the back of the saddle from rising up when roping or riding in rough country. 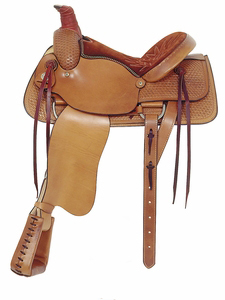 A saddle with a front and back cinch is often called a double-rigged saddle. Below: A roper ropes a cow in the wild cow milking at a ranch rodeo. of the saddle, as opposed to being farther back closer to the center of the saddle. The tree of a roping saddle is usually heavier and sturdier than trees in other types of saddles. In the past, roping saddles mainly had trees made of wood covered with bullhide or rawhide. While this type of tree is still generally considered to be the most durable for roping, they are almost always the heaviest type of trees. In recent years lighter weight trees have become more popular in roping saddles, such as wood covered with fiberglass, "Ralide" trees (Ralide is an extremely strong form of plastic), or Equi-Fit trees (sometimes also called a "Steele Equi-Fit" for its designer, Ed Steele). Below: A bare saddle tree for a ranch/roping saddle.